Overall, oral health in New Zealand has improved over the last few decades, however significant inequalities remain for some groups, especially Māori. Poor oral health is preventable but prevention must start early. Primary health care has an important role. Good oral health behaviours should be emphasised at any opportunity. Why do patients go to a GP rather than a dentist? How can GPs help improve oral health? There are three easy actions to take which will improve the oral health of patients. It is good practice to ask patients about oral health. For example, when children present for immunisations (particularly at the 15 month immunisation visit), ask “Is your child enrolled with the School Dental Service?” Other opportunities may present during the “B4 School Check”, when new patients enrol in the practice, and during consultations where poor oral health is apparent (e.g. while examining a sore throat). Best Practice tip: Make it a practice wide task to record enrolment status with the School Dental Service for all children aged under 18 years. Have enrolment forms for the School Dental Service in the practice and encourage parents to enrol their children. Place a recall to check when they next present that they have enrolled the child. If the child is already enrolled, check that they have attended appointments. Most DHBs have information, downloadable enrolment forms and lists of local school dental clinics on their website. Be aware of what services are available in the area such as Māori health providers, mobile units, contracted and private dentists. Be familiar with the options for dental care for all age groups and have information available on funding and resources. Contact your local DHB if you don't know where to start. What action can GPs take when confronted by poor oral health? There are known links between periodontal (gum) disease and diabetes, smoking, oral cancers and poor maternal oral health and pre-term or low-birth weight babies. Practices are encouraged to have enrollment forms available. Otherwise the parent or caregiver should contact the dental clinic at the school closest to their home address (listed in the phone book under school name) or ask their Plunket nurse. Primary school aged children who have not previously enrolled will receive an enrolment pack when they start school. Oral health encompasses both physical and psychosocial aspects which can have a major impact on the way an individual functions in their day to day life. Missing, damaged or diseased teeth and the pain and self-consciousness arising from this can have a marked effect on quality of life. Poor oral health can affect personal relationships, self esteem, general health and work. If a patient presents with an oral health problem, treatment may be initiated if appropriate, followed by referral for dental treatment. See here for management of common oral health conditions seen in general practice. Publicly funded dental care in New Zealand is targeted at people under the age of 18. The aim is to promote good oral health from an early age so that the benefits flow on into adulthood. Dental care for adults is provided by private dental practitioners and in most cases the cost of treatment is the responsibility of the individual. However there are some publically funded targeted services. All children need to be enrolled with the School Dental Service to receive free oral health care. The age of enrolment varies by region, but the majority are enrolled by age two and a half years. Dental care is provided by dental therapists in school, community or mobile dental clinics until the end of Year 8. Children can be referred to a dentist for further treatment, which is free if accessed under the Combined Dental Agreement. Adolescents can access free dental care under the Combined Dental Agreement. Year 8 students are provided with an enrolment form, usually from a dental therapist via the School Dental Service. They then select a contracted dentist for their care who will sign the form to access funding. Adolescents can be enrolled at any age up until their 18th birthday. The treatment covered under this agreement includes regular examinations, preventive services (fissure sealants, fluoride treatments), fillings and extractions. A fee may apply for other services such as larger tooth coloured fillings in back teeth. Other specialised services such as orthodontic and cosmetic work (e.g. tooth whitening) are not covered. For people with a Community Services Card (CSC), funding for dental care up to $300 per annum is available through Work and Income New Zealand. Some public hospitals provide limited services (pain relief and infection control) for people who are unable to access private care due to their financial circumstances. Patients accessing this service must have a CSC and are usually required to pay some of the cost of treatment. In many areas hospital emergency departments only provide dental care if it is trauma related. Other after hours care is usually provided by private dentists working on an on-call roster. The cost of this care is the responsibility of the individual. Specialised dental care is available from hospital based services for people with medical conditions, intellectual or physical disabilities, mental illness or severe dental disease that prevents them from using private dental services. A part charge may often apply to these services. Criteria for referral varies by region, check with the local DHB. In circumstances where teeth are damaged in an accident, the cost of treatment for all age groups is usually covered in part by ACC. Child oral health statistics in New Zealand are worse than countries with similar oral health systems such as Australia and the United Kingdom.5 In New Zealand until the early 1990s, dental caries rates among children were declining. However in recent years these rates have become static or even slightly increased.6 Figure 1 shows the percentage of five year old children that are free of tooth decay, clearly demonstrating ethnic inequalities. Primary health care has an important role in improving oral health. Socio-economic factors can have a major impact on oral health. Costs can limit access to services. Families on tight budgets with competing priorities may struggle to provide a good healthy diet (e.g. cost of soft drink vs. milk). They may also have limited resources to cover other costs such as toothbrushes, fluoridated toothpaste and dental floss. As the majority of oral health workers are non-Māori and non-Pacific, this may contribute to cultural barriers. There are a number of Māori oral health services operating in New Zealand (see below). Māori providers have adopted a whanau ora approach and have been very effective in improving Māori oral health where they operate.8 Barriers such as language, negative attitudes from whanau towards dental treatment and differing beliefs about dental care itself, can also contribute to poor oral health. Māori health providers currently operate successful community based oral health care services throughout New Zealand. An example is Te Manu Toroa. Te Manu Toroa provides a Kaupapa Māori model of health care for Māori in the Tauranga and Te Puke areas. Te Manu Toroa provides dental health services for Māori children and also Māori mothers (under 18) who attend the Bay of Plenty Polytechnic. The most recent addition to the dental service, was the acquisition of a fully equipped mobile dental facility, which allows Te Manu Toroa to have onsite access to the majority of its patients. Māori views on dental health services were traditionally reactionary: “If you had a bad enough tooth ache, pull it out. If you pull one out, pull them all out so you don’t have to come back again”. The cost of accessing a dentist was also an issue, hence the simple rationale that no teeth meant no ongoing costs. Te Manu Toroa provides a proactive whanau ora approach. A caregiver is required to accompany their tamariki (children) and rangatahi (teenagers) to the dental service. This approach has not diminished the levels of access. The message is stressed to whanau that the service is free until a child turns 18. Simple interventions will, save money in the future. There is a significant difference in attendance at the clinic between primary school (99%) and secondary school (55%) students. Lack of motivation of rangatahi to attend the dental service appears to stem from teenage culture rather than Māori culture. The goal of Te Manu Toroa is to increase attendance amongst rangatahi. Te Manu Toroa have worked to develop a collaborative professional approach to the provision of health services with local primary care. Patients have benefited through improved access to oral health care. To find out who the Māori health providers are in your area, contact your local DHB. Thank you to Associate Professor John Broughton, Ngai Tahu, Ngati Kahungunu, Director Ngai Tahu Māori Health Research Unit, Dunedin School of Medicine, University of Otago, for guidance in this article. Mansour M, Cox S. Patients presenting to the general practitioner with pain of dental origin. Med J Aust 2006;185(2):64-7. Lockhart P, Mason D, Konen J, et al. Prevalence and nature of orofacial and dental problems in family medicine. Arch Fam Med 2000;9:1109-12. Bell G, Smith G, Rodgers J, et al. Patient choice of primary care practitioner for orofacial symptoms. Br Dent J 2008;204:669-73. Ministry of Health. Good oral health for all, for life: The strategic vision for oral health in New Zealand. Wellington: Ministry of Health. August 2006. Ministry of Health. Oral health in New Zealand. Available from www.beehive.govt.nz (Accessed May 2009). Craig E, Anderson P, Jackson C. The health status of children and young people in Canterbury. Report for the Canterbury DHB. November 2008. DHBNZ. National School Dental Service Review: Final Report, December 2004. Ministry of Health. Wellington. 2006. Mauri Ora Associates. Review of Māori child oral health services. Report to the Ministry of Health. Mauri Ora Associates. Auckland. 2004. Ministry of Health. Age 5 and Year 8 oral health data from the School Dental Service 1990 – 2007. Ministry of Health, Wellington. Available from www.moh.govt.nz/oralhealth (Accessed June 2009). Thomson W, Ayers K, Broughton J. Child health inequalities in New Zealand: A background paper to the Public Health Advisory Committee. National Health Committee. Wellington. 2003. Ka kata a Kae – Kae laughs. This is from the story of Tinirau and Kae, where Kae eats Tinirau’s pet whale. Tinirau sends some women to exact revenge. In order to identify Kae, they have to make him laugh to see his crooked teeth. Patients may present to their GP with oral health problems. When necessary, treatment may need to be initiated followed by appropriate referral to a dental service. Good oral health behaviours should be emphasised (see here). Halitosis or bad breath can indicate a number of oral health and general medical conditions. Check the mouth (teeth, gums and tongue) for an obvious dental cause such as bacterial buildup on the tongue and consider other factors such as diet. Some medical conditions associated with halitosis include sinus infection (post nasal drip), tonsillitis, respiratory infection, diabetes and oral cancers. Gingivitis is localised inflammation of the gums (Figure 1). Symptoms include swollen bleeding gums with brushing or flossing, erythema and halitosis but not usually pain.1 For treatment and prevention, good oral hygiene should be followed. Appropriate use of an antiseptic mouth wash such as chlorhexidine gluconate 0.2% (Orion brand fully subsidised) may also assist (see here for appropriate use). If applicable, smoking cessation should be advised. Periodontitis is the loss of supportive bone structure around the root of the teeth caused by chronic gingivitis.1 Symptoms include receding gums that bleed easily on contact and subgingival dental plaque. Referral for mechanical debridement and ongoing dental care is required. Periodontal disease is rarely a feature of systemic disease. Pericoronitis is an acute localised infection under the gum flaps of a partially erupted tooth or impacted tooth. This most commonly affects the wisdom teeth.1 Initial treatment is irrigation of the area to remove debris (e.g. trapped food particles), chlorhexidine mouthwash and adequate analgesia. If the infection involves the wisdom teeth bilaterally and the swelling is marked, there can be airway compromise, requiring urgent hospital referral. If there is significant swelling or evidence of cellulitis or systemic disease, amoxycillin (500 mg three times per day, for five days) or metronidazole (400 mg three times per day, for five days), may be prescribed. Kawakawa (Macropiper excelsum, Māori Pepper Tree) is a traditional Rongoa Māori treatment used for toothache. The leaves, which have a spicy taste, are chewed and retained in the mouth, while the saliva is swallowed. Kawakawa is related to the black pepper tree and kava. The leaves contain the essential oil myristicin, which is also the predominant psychoactive ingredient in nutmeg, although kawakawa is not used for psychotropic purposes. There have been no scientific studies on the biological activity or toxicology of kawakawa, however no adverse effects or interactions have been recorded. Dental caries is a disease caused by bacteria which damage hard tooth structure (also known as tooth decay or cavity). It is asymptomatic in the initial stages. If left untreated, the patient will usually start to notice temperature sensitivity and mild pain. Preventative education and dental treatment is required. Sensitive teeth may be caused by periodontal disease, caries, trauma, toothbrush abrasion, erosion or attrition, age, smoking and medical conditions (e.g. radiation therapy). Patients often experience acute localised pain while eating and drinking cold foods/liquids. Toothpastes specially formulated for sensitive teeth can be used. Several applications may be required before sensitivity is reduced. Dentists can also apply desensitising agents. It is also important to eliminate any possible etiological disease. 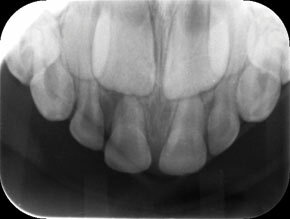 Gingival hyperplasia (hypertrophic gums) can be an adverse effect of calcium channel blockers or cyclosporin and some antiepileptic medications. All people with dental abscess require referral for further dental care such as root canal treatment or extraction (Figure 2). Treatment of acute symptoms can be managed in general practice. If pain is significant, prescribe adequate and regular analgesia – begin with paracetamol or ibuprofen which can be taken together if pain relief, with either alone, is insufficient. If pain relief is still not adequate, add codeine. Patients can be advised to consume cool, soft foods. If the patient has severe cellulitis, they may require hospital admission for intravenous antibiotics and fluids, or emergency referral if swelling poses a serious risk to general health (e.g. a compromised airway). In rare cases, cavernous sinus thrombosis may be a late complication of dental abscess or infection. If there is marked swelling, the patient is in extreme discomfort or if dental care is not able to be accessed straight away (e.g. over a weekend), the abscess may be lanced and drained, using topical anaesthesia (or freezing with ethyl chloride spray). Incisions usually epithelialise rapidly, causing the abscess to fill with pus again, so it is important to follow-up with a hot, salty mouthwash to encourage continued drainage. Trauma causing tooth loss is common, especially in children and can result in fracture of teeth (or jaw), tooth loosening or tooth loss (avulsion). All patients with tooth trauma require dental referral and radiography.2 Tetanus injection may be required in some circumstances. Prophylactic antibiotics (amoxycillin) are only required in some cases of tooth avulsion. Ensure that ACC information is completed. In the case of non-accidental trauma, injuries need to be appropriately documented and history recorded (see box below). 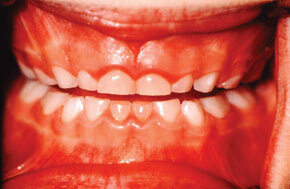 Injuries to primary teeth may cause damage to permanent successor teeth. The preferred emergency treatment of an avulsed permanent tooth is immediate re-implantation, ideally within five minutes (and up to 15 minutes). If rinsing is needed, use normal saline and also flush out any clot from the socket before the tooth is re-implanted. Touching, rubbing or cleaning of the root should be avoided as this reduces the likelihood of successful re-implantation. Hold the tooth by the crown. Look at the adjacent teeth to gauge the line/angle of the replaced tooth. The tooth can be held in place by gently biting on a piece of gauze. The patient should then be immediately referred to a dentist. Primary (deciduous) teeth should not be re-implanted as doing so may damage the permanent tooth above (Figure 3). If the tooth is unable to be put back in, the patent should be referred immediately to a dentist and the tooth transported in the patient’s mouth, under the top lip (but the risk of swallowing the tooth must be considered, especially in children), or placed in a container with fresh, cold milk or saline (do not use water). Oro-facial injuries occur commonly in cases of non-accidental injury. Reports of suspected child abuse can be made to the Child Youth and Family Service – 0508 FAMILY (0508 326459). Alternatively, and for suspected abuse in adults, contact the police. The role of the doctor (or dentist) in this situation is to observe, document and report the injuries. Support should be offered, but an in-depth interview of the victim to confirm whether or not abuse has occurred should not be attempted, as this is the responsibility of the social worker or police officer. “Dry socket” – acute alveolar osteitis is seen in patients who have a history of extraction in past 24 – 48 hours, and present with severe, persistent throbbing pain that is localised to the socket. The socket is usually very tender to palpation and there is no blood clot visible. There may be associated halitosis. A dry socket is more frequently seen in people who smoke, especially if they have not abstained since extraction. 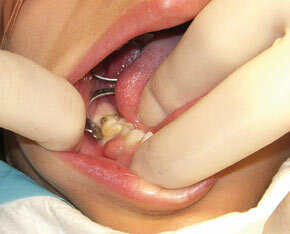 Initial treatment is to examine the socket for debris and then irrigate with sterile saline. Antibiotics are not indicated but analgesics may be required.4,5 The patient can be referred to a dentist for packing of the socket. Post extraction haemorrhage is usually able to be stopped with a few minutes of local pressure on the bleeding socket with a gauze swab or pack.4,6 This also applies to patients who may be taking aspirin or NSAIDs.4 If the bleeding continues then refer for further dental care. Ideally this type of problem should be dealt with by the dentist who performed the procedure, and the patient would normally be provided with written instructions on post extraction care.6 A thorough review of the patient’s medical history should be taken to rule out a haematological disorder. Lip bite post local anaesthetic is commonly seen in children. Significant trauma may be caused by a child chewing on a numb lip. For people with cardiac conditions, an important goal is prevention of dental caries and periodontal disease. Education and regular dental examination to detect disease, or risk of disease at an early stage, is ideal. Nguyen D, Martin J. Common dental infections in the primary care setting. Am Fam Physician. 2008;77(6):797-802. Douglass A, Douglass J. Common dental emergencies. Am Fam Physician. 2003;67:511-6. Clinical Knowledge Summaries (CKS). Dental abscess management. Available from www.cks.nhs.uk (Accessed June 2009). Kingon A. Solving dental problems in general practice. Aust Fam Physician. 2009;38(4):211-6. Patel K, Driscoll P. Dental knowledge of accident and emergency senior house officers. Emerg Med J. 2002;19:539-41. National Heart Foundation of New Zealand (NHF). Guideline for the prevention of infective endocarditis associated with dental and other medical interventions. NHF 2008. Available from www.nhf.org.nz (accessed June 2009). Ma mahi ka ora – ‘By work one is sustained’ Mahi in this instance is referring to oral hygiene. Fluoride is necessary for promoting repair of the teeth by aiding remineralisation of the surface. It works best when used frequently and in low concentrations. Fluoride may be obtained topically from toothpaste and mouthwash or systemically from the water supply or supplements. Both kinds of fluoride are important. People drinking bottled or filtered water as their primary source of drinking water could be missing the decay preventative effects of optimally fluoridated water that may be available from their community water supply. Boiling water does not reduce the fluoride content. Fluoride tablets can be considered for at-risk children and adolescents living in communities where the water supply is not fully fluoridated. The effectiveness of this form of supplementation is not as clearly documented as water fluoridation. Sodium fluoride tablets (1.1 mg) can be purchased at pharmacies or prescribed fully funded. Tablets should be sucked, chewed or dissolved in drinking water (two 1.1 mg sodium fluoride tablets dissolved in 1 L drinking water). Dose depends on age and the existing fluoride level in the drinking water supply (Table 1).2,3 This does not mean that exactly this dose should be taken per day, but that important anti-cavity benefits may be gained with this amount, without causing any adverse effects on health. Fluoride supplementation in pregnancy is not recommended because there is little evidence of benefit for the developing foetus.4 Tooth enamel, the most caries-susceptible area of teeth, calcifies after birth making fluoride given before birth ineffective in decay prevention. Fluoride can cause symptoms of toxicity at a level of 3 – 5 mg/kg, resulting in nausea, vomiting, diarrhoea and hypersalivation, due to formation of hydrofluoric acid in the stomach. More serious toxicity (e.g. hypocalcaemia) can occur with ingestions over 5 mg/kg. “Regular strength” toothpaste contains 1 mg fluoride per gram of toothpaste, therefore, symptoms may occur if a 10 kg child ingested 30 g toothpaste (~ ¼ tube) or more. Poisoning is less common with ingestion of fluoride tablets. Sodium fluoride 1.1 mg tablets contain 0.5 mg fluoride, therefore a 10 kg child would need to ingest around 60 tablets for toxicity to occur. With small ingestions, milk may be given to relieve gastrointestinal symptoms (calcium binds with fluoride). More serious toxicity requires immediate medical attention. Teeth should be brushed for two minutes, two times per day (in the morning and last thing at night). All the surfaces of the teeth should be brushed as well as the top surface of the tongue. Powered toothbrushes with oscillating heads are more effective at removing plaque than standard toothbrushes. Otherwise choose a toothbrush with a small head and soft bristles. Toothbrushes should be replaced every three to four months or sooner if the bristles become frayed. This ensures the brush is producing an effective clean and avoids bacteria build-up. Children should use a child-sized brush for ease of use. Children’s brushes often need replacing more frequently than adult brushes. Toothbrushes should not be shared. Brushes should be rinsed with tap water after use and stored upright in an open container or holder to allow air-drying. Ensure that toothbrushes stored together do not touch to avoid cross-contamination. There is no evidence that toothbrush cleaning solutions or storing brushes in mouthwashes has any additional benefit. Toothpaste containing 1000 ppm fluoride (0.22% w/w sodium fluoride or 0.76% w/w monoflurophosphate) should be used. Lower strength (400 – 450 ppm) fluoride toothpaste is marketed for children, however regular fluoride toothpaste can be safely used as long as the amount is reduced. Adults and children over six years should use a pea-sized amount, younger children need only a smear of toothpaste. After brushing, spit but do not rinse the mouth as fluoride is effective when applied topically. Parents should start brushing their infant’s teeth as soon as the first tooth emerges from the gums. The tooth may be wiped with a soft cloth (e.g. a clean handkerchief) with a small smear of fluoride toothpaste. When appropriate change to a soft, small headed toothbrush with a smear of fluoride toothpaste. The child should spit out when they are able to but not rinse their mouth. Try not to let the child swallow the toothpaste. Dental floss should be used daily (or at least three times per week) to help to remove plaque and food particles between teeth. Dentists may also recommend an interdental brush. The cariogenic bacteria, Streptococcus mutans has been shown to be a risk factor for early development of dental caries. These bacteria can be transmitted via the saliva from parent to child in a variety of ways such as sharing spoons, pre-tasting food, putting their infant’s dummy into their own mouth and kissing on the lips. There are many other factors involved in the development of caries. These include whether the infant is fed by bottle or breast. If bottle fed, the content and timing of feeds, the overall sugar content of the diet and the frequency and type of snack foods are all factors. An important message for caregivers is that their own oral health impacts on their children. Fluoride mouthwash helps to reduce and prevent tooth decay, providing slightly more protection than using fluoride toothpaste alone.7 However for people with healthy teeth and gums, fluoride toothpaste is usually adequate. Fluoride mouthwash should not be used by children aged less than six years, due to the risk of swallowing the product, unless under professional instruction. Antimicrobial mouthwash (e.g. containing chlorhexidine or triclosan) reduces the bacteria count and inhibits bacterial activity in dental plaque. It can be effective in reducing plaque and gingivitis (an early form of gum disease) but it is usually not necessary for people with healthy gums. Chlorhexidine mouthwash should be used intermittently only as it can stain the teeth and tongue. It should not be used straight before or after tooth brushing as the detergents in toothpaste interact with chlorhexidine. The New Zealand Dental Association. Your oral health: Oral health topics. The American Dental Association. Oral health topics A–Z. Ministry of Health. Fluoridation in New Zealand. Ministry Of Health. 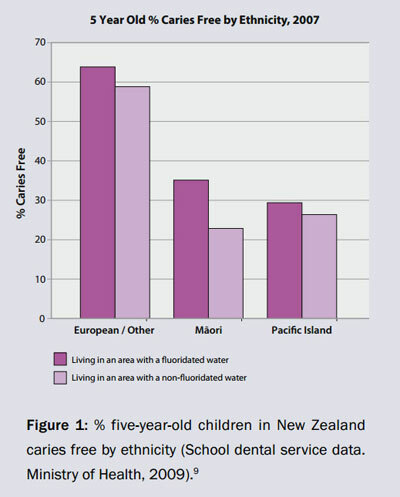 Fluoridation in New Zealand. Available from: www.moh.govt.nz/fluoride (accessed June 2009). Ministry Of Health. Oral health services agreement. 2001. Available from: www.moh.govt.nz/moh.nsf/pagesmh/7648/$File/contract-operational-guidelines.doc (accessed June 2009). American Dental Association. Facts on fluoride. 2005. Available from: www.ada.org/public/topics/fluoride/facts/fluoridation_facts.pdf (accessed June 2009). Leverett D, Adair S, Vaughan B, et al. Randomised clinical trial of the effect of prenatal fluoride supplements in preventing dental caries. Caries Res. 1997;31(3):174-9. National Health and Medical Research Council Australia. NHMRC statement : the efficacy and safety of fluoridation 2007. Available from: www.nhmrc.gov.au/media/media/rel07/_files/Fluoride_Flyer.pdf (accessed June 2009). De Liefde B, Herbison G. The prevalence of developmental defects of enamel and dental caries in New Zealand children receiving differing fluoride supplementation, in 1982 and 1985. NZ Dent J 1989;85:2-8. Marinho V, Higgins J, Sheiham A, Logan S. Combinations of topical fluoride (toothpastes, mouthrinses, gels, varnishes) versus single topical fluoride for preventing dental caries in children and adolescents. Cochrane Database Syst Rev 2004;1:CD002781. Weintraub J. Family matters: Influence of biology and behaviour on oral health. N Y State Dent J 2007;73(2):14-9.